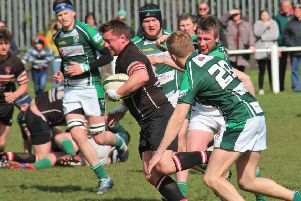 Old Rishworthians kept their Yorkshire Two promotion hopes on track with a seven-try 43-21 win at West Park Leeds, a club where they had previously never won. There was certainly no grumbling at the start as Rishworthians romped into an early 12-point lead. Playing up the slope they dominated the early exchanges and a great long pass from fullback Jacob Ford put left wing Anthony Shoesmith away. He had plenty to do but broke through tackles to score the first try. Josh Kelly added the conversion. The game had hardly restarted when centre Taniela Bakoso gathered a clearance kick and made the first of a number of strong runs. From the breakdown, the ball went wide and No 8 Gerard Rollings put right wing Ben Wainwright in at the corner. The visitors relaxed and suddenly found themselves having to defend on their own line. They did it well until the ball finally went out and a missed tackle allowed a converted try for the home side. Captain Fraser Swarbrooke regathered the ball brilliantly from the restart and started another attack, which saw Rishworthians camped in the home half. Eventually Bakoso burst through and passed to fellow centre Sam Nunn for a simple run-in. Kelly converted. Wainwright limped off and his replacement Luke Flanagan almost got in. Then scrum half Ed Cockroft darted through a gap but was held up short and teenage flanker Jack Davis, who had an outstanding game, went close before Rollings picked up a loose ball and dived over for the bonus point try. Kelly converted to make it 7–26 at half-time. Early in the second half Rishworthians ran the ball from a lineout and Shoesmith burst through the centre to score. Kelly converted. The visitors kept the pressure up and Kelly broke through before slipping the ball to Bakoso for the sixth try. The home side fought back and a long kick through was scrambled into touch near the visitors line. A quickly taken throw caught Rishworthians napping and the scrum half strolled over for a converted try. Rishworthians came straight back with wave after wave of attack, with lock Callum Heseltine, outstanding throughout, making some strong carries. They forced a lineout five-metres out, but lost it. However when Stone charged down the clearance attempt, man of the match Heseltine was the first to react and touch down. West Park again fought back and a series of forward drives got them a converted try in the final minutes. At Copley the Development team romped to a 90-0 Merit League victory over Otliensians with 14 tries. Lee Atkinson scored two and kicked 10 conversions. Oliver Marshall ran in three tries and there were two each for Sam Bake and Liam Phillips. Other tries came from Liam Normanton, Ben Rooney, Will Bowers, Kurt Sutcliffe and Ben Sutcliffe.